It all starts with the “Chief”, Tor. There is a secret elite team of highlanders who specialize in certain aspects of battle and Bruce has selected Tor to be their Chief. Bruce knows that Tor isn’t going to agree to this easily and hopes that the prospect of a bride might sway his decision. However, Tor wants nothing to do with the secret team nor does he want to make an alliance with the Fraser’s. However, Christina’s abusive father makes Christina sneak into Tor’s chambers while he’s asleep so that she can be “caught” in his bed, forcing Tor to do the noble thing and marry her. Not only is Tor now in charge of a group of men that have been his enemies for years but he also has a wife who seems to be more trouble than he bargained for. Christina got on my nerves a lot in this book. Tor will tell her to do something and she will do the exact opposite. It seems like she’s always getting herself into trouble and Tor is always getting her out of it. However, Tor is clueless on how to be a good husband. He is gone all day and comes home at night for a shag and then is up and gone before Christina wakes up. So I guess I cannot blame her for exploring on her own. I really liked the fact that even though these two find the other attractive, neither of them are thrilled with their current situation and must over come a lot in order to work in harmony together. 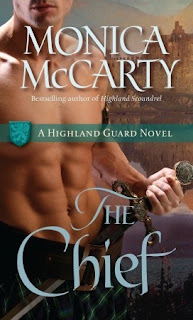 Monica McCarty does a great job weaving both the romance and the upcoming war into one good Highlander story. You get a glimpse at the other men in the Highland Guard and I personally cannot wait to read their stories. Tor is sitting at the table talking with his (ex) leman when Christina walks in. … guys… they just done get it. I haven’t read a good Highland romance in a long time and this one sounds really interesting. Thanks for the review!